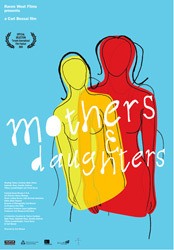 Mothers & Daughters is a comedic exploration of the turbulent lives of three very different women and the complex relationship each has with her daughter. The high-strung pulp romance novelist Micki eclipses her sullen daughter Rebecca, an actress who finds Mom overbearing. Brenda is a dedicated housewife and mother who is shocked to learn that her husband has left her for a younger woman. Her daughter Kate is less sympathetic, and appears more devastated by her father`s departure than her mother. And Celine is a Metis woman who owns her own business. When she is hired by Cynthia, a young professional who was adopted into a white household many years earlier, troubling questions arise. This film should not be confused with the 2016 feature Mothers and Daughters.